THE Oasis leisure centre is set to be turned into a stage to rival any in the West End when the Pet Shop Boys come to town. 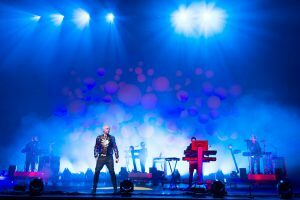 Chris Lowe, who makes up one half of the duo, has promised fans it will be a visual spectacular when they perform on June 7 as part of their first tour for five years. ‘It is a multi-media show, with television screens and looks really great,’ said the 47-year-old. Chris and Neil Tennant started the tour several months ago and so far have visited America, Mexico, Chile, Brazil and Argentina. They are now enjoying a couple of weeks off before they start the European leg. ‘At the moment this tour seems to be never-ending,’ said Chris, who says he doesn’t get homesick. ‘We keep adding more and more dates but we both love touring. ‘We didn’t do a lot of it in the 1980s when we were at the height of our success but we’ve realised since how much we enjoy it. And he said that 3,000 people – the capacity at the Oasis – sounded like a good number to be playing to. ‘I like venues that are standing, but a lot of places see us as a seated type of act,’ he said. ‘We played to really small audiences, like at the Barfly in London which is just above a pub, to a football stadium in Colombia. But 3,000 sounds pretty good. At the June concert, fans can expect to hear all their old favourites including It’s A Sin, Go West and West End Girls. Chris, who last visited the town when he was working for an architectural firm many years ago, said that both he and Neil were looking forward to playing in the town. ‘We’ve not played there before so it should be a good laugh,’ he said. And Chris also revealed that a new album may be on the cards as the disco duo are still busy writing new material. ‘We just go into our little studio and write because that’s what we enjoying doing,’ said Chris. ‘It is best to do it while you are in the mood rather than sitting down and thinking right, I have to write a song now’. We just write when we feel like it. But out of their older material one song still stands out for Chris.